With Real Madrid's dramatic foray into semifinals of the Champions League on Wednesday, Sputnik looks into several other playoffs within the framework of the tournament. It was Cristiano Ronaldo who managed to score and help Real Madrid make it to the Champions League semifinals at the 90th minute of the April 11 match between the Spanish club and Italy's Juventus. 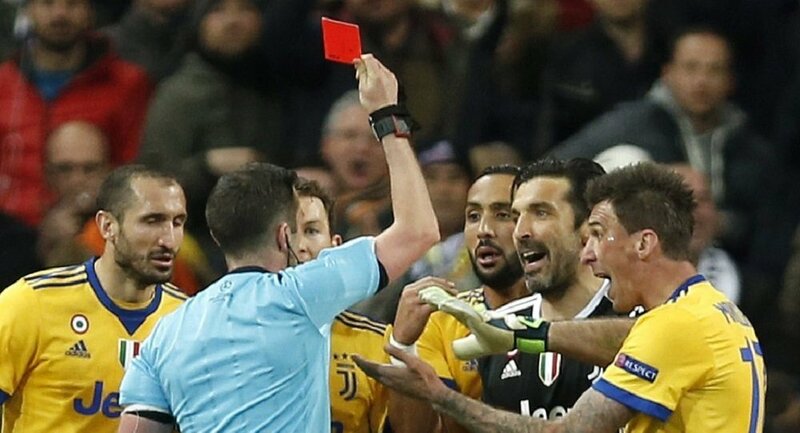 The Italian team scored three goals throughout the game but at the end of the day, Real's Lucas Vazquez earned a soft penalty, prompting anger from Juventus goalkeeper Gianluigi Buffon. — #BBnaija Didi's Store 🇳🇬 (@surest_diva) 11 апреля 2018 г. He was finally sent off with a red card for brutal behavior and Ronaldo was quick to seize the opportunity. Despite losing the match 1-3, Real forayed into the next stage of the Champions League with a 4-3 win. This game, played during the 1998/99 season, is believed to have been a dramatic high point in the history of the Champions League playoffs. Former German football star Franz Beckenbauer recalled that he left the VIP-box at the 90th minute of the match and went to the football field by elevator. He said that when he came to the field he saw the 1:2 score instead of 1:0, thinking that the scoreboard was broken. But in fact, it were Manchester United players who got the better of their German rival by scoring two goals in a record period of time and securing the 2-1 win. This 2004/05 season game can be described as another legendary playoff of the Champions League. Although Liverpool was losing 0:3, it managed to drastically improve the situation within 15 minutes of the second half by scoring three goals in a row. A subsequent penalty shoot-out saw the British club triumph 3:2. It was one more dramatic Champions League playoff in the 2016/17 season which saw a brilliant performance by Barcelona's Neymar and Sergi Roberto. Paris Saint-Germain upset Barcelona 4:0 in the first game so the Catalan club's further chances were considered minimal. Winning 3:1 at the 88th minute of the match, Barcelona then quickly scored three more goals and made it to the next stage of the Champions League. By the 90th minute of this jaw-dropping playoff of the Champions League's 2012/13 season, Malaga was leading 2:1. — ُ (@6orxi) 2 ноября 2017 г. However, Borussia fought to the bitter end, managing to equalize and then score one more goal to finally celebrate the 3:2 win.